Is Amir Khan really the best opponent for Floyd Mayweather? If Floyd Mayweather Jr. keeps his word, he'll fight Amir Khan on May 3 at the MGM Grand Garden Arena in Las Vegas. Mayweather announced via Twitter a week ago that he would leave it up to a fan vote to determine his next opponent. He gave the fans a choice of either Khan or Marcos Maidana. Voting ended on Sunday and Khan won a comfortable victory. According to Lockerdome, Khan tallied 20,105 votes to 15,474 for Maidana. It was a clever move by Mayweather, though it didn't pick the best opponent. That, of course, is because the best opponents weren't on the ballot. The ridiculous boxing "Cold War" that pits Golden Boy and Showtime on one side and Top Rank and HBO on the other prevented a number of far better candidates from being on the ballot. On Sunday, Khan tweeted some "facts," that he tried to use to dispel the notion that he has a bad chin. He had the gall to compare himself to fighters such as Mike Tyson, Arturo Gatti and Ricky Hatton and used a knockout-per-fight ratio as proof he was in line with them. Khan, for instance, notes that he has been stopped twice in 31 bouts, an average of one per 15.5 bouts. He points out that Gatti was knocked out five times in 49 bouts, an average of once every 9.8 bouts. Of course, Gatti was stopped on cuts several times and fought a massively better level of competition than Khan has faced. Khan was stopped by Breidis Prescott and Danny Garcia. Gatti was stopped by Mayweather and Oscar De La Hoya, among others. That, though, is beside the point. Presented with options of either Khan or Maidana as an opponent for Mayweather, there's a far better chance of Khan giving Mayweather a decent fight than Maidana. Mayweather would box Maidana's ears off and Maidana would likely never win a round. Khan simply hasn't performed to the level his abilities suggest he's capable of doing. But if he got a Mayweather fight, perhaps Khan would rise to the occasion and make it an entertaining match. 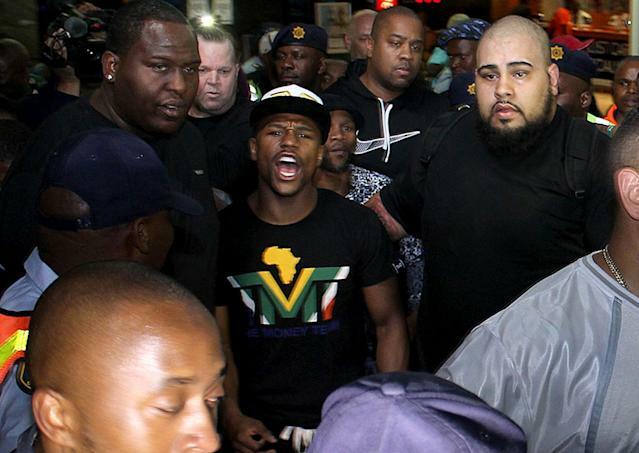 It is a testament to Mayweather's greatness that there are so few viable options in and around his class. But of those who are viable – in other words, those who aren't signed to a promotional deal with Top Rank (think Manny Pacquiao and Timothy Bradley) or appear regularly on HBO (think Gennady Golovkin) – Khan is about as good as could be now. Personally, I'd have opted for Keith Thurman over either of them, but Mayweather didn't put Thurman on his list. The problem with choosing Khan, even though he's a better potential opponent than Maidana, is that he's done nothing to deserve the opportunity. Showtime had a brilliant year in 2013, largely on edgy matchmaking by Eric Gomez and Richard Schaefer at Golden Boy and Stephen Espinoza at Showtime. Khan is 2-2 in his last four fights and has done nothing to earn the Mayweather fight. He hasn't performed well, even in defeat. He lost to Lamont Peterson, got knocked out by Garcia, stopped Carlos Molina and then lucked out a win over Julio Diaz in a fight he could have lost. Showtime's matchmaking last year encouraged fighters to put on great, entertaining bouts, and to not worry simply about a win or a loss. Khan has lost two of his last four while not looking particularly good in any of those matches. Mayweather is one of the greatest fighters of all-time and, as he heads down the stretch of a brilliant career, he doesn't need to fight anyone. As much as I – and sports fans in general – want to see him fight Pacquiao, it is hardly a fight that will save boxing. Boxing will survive with or without Mayweather-Pacquiao. When he's 50, he may regret not having faced Pacquiao, but Mayweather is having far too much fun dictating terms and soaking in the adulation of being the sport's biggest star, and he's not thinking down the line just yet. So, if he is true to his word, he'll fight Khan in a bout that few care to see. Khan doesn't deserve it, and it sets a horrible precedent in that Khan is being given a bout on the basis of just 20,000 votes without having earned the right in the ring. The problem isn't going to be solved, because the positions of the parties are too intractable. HBO and Showtime have only really come together on one pay-per-view, the 2002 Lennox Lewis-Mike Tyson bout. It appears unlikely that they'll come to such an accommodation in the near future. Khan was the best choice in this poll, even though the only thing he's done recently to deserve a fight against the biggest star in the sport is to sign with the right promoter and with the right TV network.